2 of 4 In large bowl, work dough and lemon zest together with a wooden spoon until well blended. (If dough becomes too soft to work with, refrigerate for 10 minutes to firm.) Press dough evenly over bottom and 1/2 inch up sides of prepared pan. 3 of 4 Bake at 350 degrees F for about 20 minutes or until golden brown and center springs back when lightly touched. Remove springform pan to wire rack. Using thin metal spatula, carefully loosen crust from side of pan. Remove side of pan; cool crust completely on wire rack. 4 of 4 Place crust on serving platter. Spread lemon curd over crust. 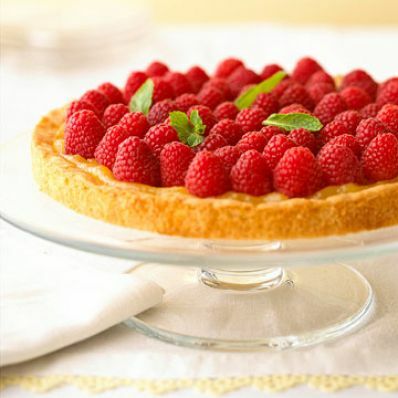 Top with raspberries. If desired, garnish with mint.